Just fresh out of a screening of Batman's latest installment. I can shamelessly say that it didn't disappoint. Covering 150 mins of eye-popping action and performances, it is a feist for any action-thirsty person. 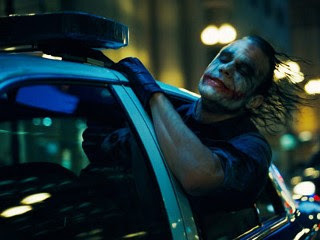 Heath Ledger easily steals the scene (in a role any actor would die for--and sadly, later he did) as the Joker. Yeah I thought he actually did portray one of the best movie villains of all time. Very disturbing, chillingly cool and shockingly funny. As for the rest, well it's not perfect but it delivers one of the most exciting and entertaining 152 minutes that I have ever experienced at the cinema. Stop reading this and go see it! This entry was posted on miðvikudagur, júlí 23, 2008 at 5:16 f.h.. | You can skip to the end and leave a response.